Math is immersed in our daily lives. When we weigh fruit at a supermarket, receive change at a store, or measure flour for a favorite brownie recipe, we are using math concepts. When children reach grade school they begin to “formally” learn mathematics. Yet even at a very young age, children can develop an understanding of basic math principles in fun and engaging ways. 1. Sequencing. Sequencing is an understanding that events and objects occur in a specific order – an important precursor to both math and reading. To practice sequencing at home, have your child gather a group of toys and put them in a pile. Then, using sequencing words, ask your child to order them. For instance, you might say, “In one line, place the green truck first and the yellow car second. Place the purple block third. Finally, place the green ball last in the line.” You can also create your own sequencing cards describing events in a story. For example, tell your child a story about a girl who wakes up, brushes her teeth, eats breakfast, and goes to school. Then make 4 picture cards describing these events, mix them up, and have your child put them in order. 2. Grouping and Sorting. Make a trip to the supermarket academically productive by teaching your child grouping and sorting. For example, grab an assortment of red, green, and yellow apples and several plastic produce bags. Ask your child to put all of the green apples in one bag, red apples in another, and so on. You can also select a group of tomatoes or plums and have him put the smaller ones in one bag and the larger ones in another. At home, have him sort crayons in containers based on color, blocks in boxes based on shape, or balls in baskets based on size. 3. Time. The concept of time can be a tricky one to grasp at a young age, but these age-appropriate exercises can help your child develop a basic understanding. Try setting a timer to help your child understand how long certain tasks take to complete. For example, time her as she brushes her teeth, eats breakfast, or gets dressed. Talk about which task took longer, how much longer one task took than the other, and so on. Also discuss with her what time she does certain activities. For instance, she might wake up at 7:00am, go to school at 8:30am, and eat dinner at 6:00pm. Discussing time in this manner with help your child begin to understand the concept. 4. Shapes. ‎Have your child play with different shapes to learn both their names and how they feel. Try cutting out basic shapes using felt (triangle, rectangle, square, diamond, etc.) and put them all in a box. Have her take one shape out of the box and tell you its name. Also ask her to describe how many sides it has and how it feels. This kinesthetic approach will help the names and visual representations stick in your child’s long term memory. 5. Estimation and Prediction. Teach your child estimation using every day items at home. For example, have him create a stack of magazines and a stack of books, and, before doing so, ask him to predict which one he thinks will be taller.‎ You can also draw a large square on a sheet of paper and have him estimate how many Cheerios he can fit in that square, then actually fill the square with Cheerios. Have him compare the actual number by counting them (another important math skill!) to the estimated number. Math is an important skill that is weaved into almost all aspects of our lives. 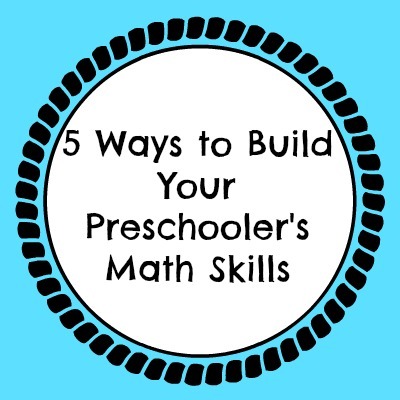 Even at a very young age, children can learn fundamental math concepts through play and engaging activities. It’s never too early to start learning the basics!